1. Combine beef pieces with all the ingredients numbered 2. 2. Pressure cook the beef adding 1 – 2 tbsp water for 4 – 5 whistles or until completely cooked. Open the cooker after pressure releases or after 15 minutes. 3. Heat coconut oil in a pan over medium-high heat. Add sliced onion, little salt and curry leaves. Cook until onion turns lightly browned. Add ginger, garlic and coconut tidbits. Saute until onion turns golden. Add cooked beef pieces along with the gravy. Cook on medium-high flame until moisture is mostly evaporated. Bring down the flame to medium-low and cook for 10 – 15 minutes until beef pieces are roasted well. Add more coconut oil in between, if required. Add 1/2 – 3/4 tsp crushed fennel seeds and 1 tsp crushed black pepper. Cook for 1 – 2 minutes. Add a pinch of garam masala powder, if required. Switch off the flame. 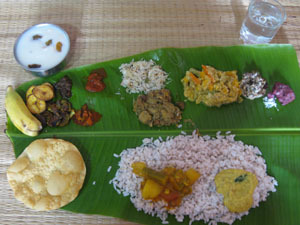 Serve with rice / porotta/chapathi.